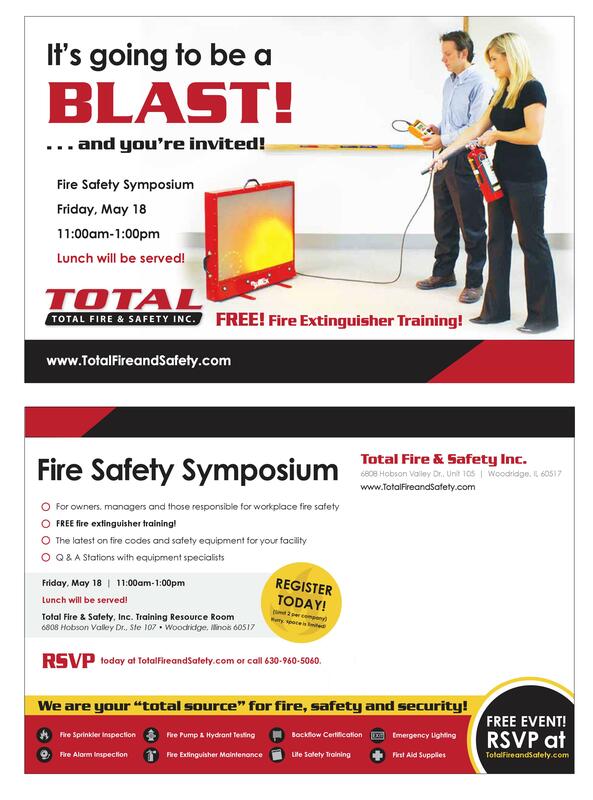 at Total Fire & Safety! Register below! Space is limited! 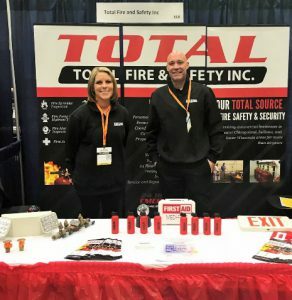 Total Fire & Safety Tees it Up! Thank you to our client, Discount Tire, who chose a beautiful day for their recent annual golf outing. It was held July 27 at the lovely Tamarack Golf Course in Naperville, Illinois. 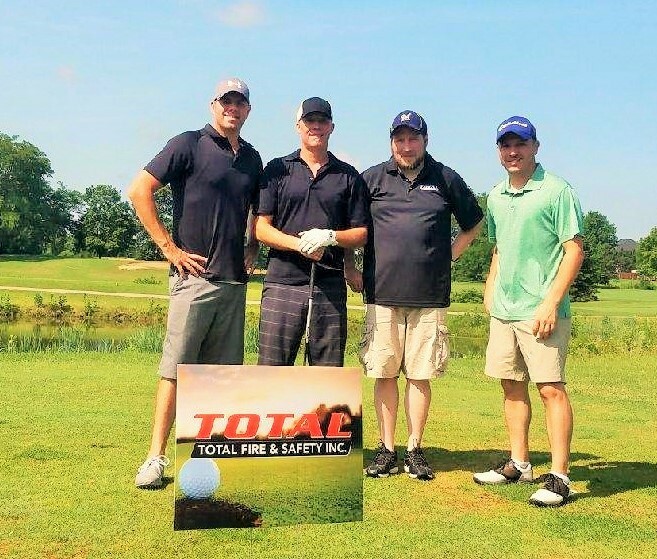 This was the third consecutive year we participated, sending a fearless foursome to the golf outing and we were as always, happy to support our client. This year, we even sponsored a hole with handsome, environmentally appropriate signage to add to the festivities. The foursome representing Total Fire & Safety came from varied key service areas of the company. Pictured here are some of our finest employee golfers! From left to right, Jason Schroeder, Vice President; Jason LeGrand, Business Development; Nick Ingoglia, Fire Division Manager and Chris Burroughs, Dispatch Coordinator. Were it not for the tournament, would these four fire safety men be on the golf course? Golf courses are not typically a fire risk, but fire has been known to destroy the maintenance buildings and club houses that sit adjacent to them. At Total Fire & Safety, our services protect many recreational venues in Chicagoland, Wisconsin and Indiana. And that’s important because such fires break out more often than you think. In fact, this past May, a Texas and Ohio golf course building were both destroyed from fire. In Brownsville, Texas, the clubhouse at Valley International Country Club had a blaze on May 13, which most likely began in the kitchen area. Although nobody was hurt, the beautiful venue, including the original two-story clubhouse built in 1910, was ruined. The fire was fueled by a “built-up roof” which was heavier and held the heat more easily as the blaze raged for 12 hours. Just a few days earlier, fire had destroyed a maintenance shed at the Carlisle Golf Course in Grafton, Ohio. The fire broke out after midnight on May 11 from an unknown cause, but arson is not suspected. The fire department was able to keep the fire from spreading to a nearby residence, but in this case, their challenge was the water source. Since the course was not close to fire hydrants, they had to set up a water shuttle to bring water to the blaze. It just goes to show how the need for fire safety is everywhere, even in the places we least expect. At Total Fire & Safety, we’re proud to support our clients and keep our recreational areas, as well as our workplace, as safe as possible. If we can help you with your commercial fire protection, please don’t hesitate to contact us at 630-960-5060. Category: Client Events, Fire News, Fire Safety, Total Fire and Safety Tags: commercial fire protection, fire and safety solutions, golf outing, Total Fire & Safety, Total Fire & Safety client events | Comments Off on Total Fire & Safety Tees it Up!